Simultaneously the land of Catherine the Great, Joseph Stalin, and Vladimir Putin, Russia has captivated the minds of travellers for decades, no small thanks to mystery of the land behind the old iron-curtain. The largest country in the world has only really opened up to travellers from the western world in the last few decades, and now many adventurous tourists are discovering the wonders of a holiday in Russia. Most travellers to Russia focus their attention on the western end of the country, where cosmopolitan cities like Moscow and St Petersburg offer world-class symphonies and ballets, and famous tourist attractions like the Kremlin, St Basil's Cathedral, and the Winter Palace. Far from the stereotypical picture of drab Communist-era concrete buildings, the cities are attractive and bustling with culture in the form of museums, art galleries, and nightlife. Unknown to many, Russia extends as far south as the Black Sea, and tourists in this area can take advantage of idyllic summer weather to relax in resorts like Sochi, Dagomys, and Gelendzhik, or take a cruise down the Volga River. In winter, skiers flock to the Caucasus region, heading to the slopes of Russian ski resorts like Dombai and Kransaya Polyana. The west is only a small part of Russia's vast landscape, however most tourists never venture into the Russian Far East, home to port cities like Vladivostok and Khabarovsk that are made up of an interesting jumble of tsarist-era buildings and cosmopolitan sensibilities. For those that do, a six-day ride on the famed Trans-Siberian Railway is the perfect way to experience the Russian landscape. In winter, the weather in Russia is bitterly cold, especially in Siberia. Most travellers prefer to visit in the warmer months; as it tends to be rainy in July and August, the best time to visit Russia is May and June (spring), or September and October (autumn). Read more on Russia's Climate and Weather. -Watch a performance of Swan Lake at the renowned Bolshoi Ballet and Opera Theatre. -Spot the colourful onion-shaped towers of St Basil's Cathedral in Moscow's Red Square. -Visit the Winter Palace and Hermitage Museum, home to the great art collections of the tsars. -Take a tour of the Golden Ring to see stunning traditional Russian Orthodox churches. Read more about Russia Attractions. -Ride the Trans-Siberian Railway from Moscow to Vladivostok. -Go swimming on the beaches of Gelendzhik on Russia's Black Sea coast. -Relax in the Matsesta Spa in Sochi. -Ride the Moscow Metro, if only to see the beautifully ornate stations. Read more about Russia Activities. 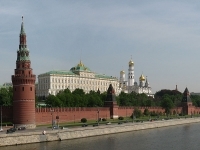 Getting to Russia from the UK is fairly simple, as there are direct, cheap flights to Moscow and St Petersburg from London, operating daily, which take about four hours. There are direct flights to Russia from the US out of New York, Miami, and Los Angeles. Most flights to Russia land at Moscow's Domodedovo Airport and St Petersburg's Pulkovo International Airport. Get more information on Russia Airports. Russka by Edward Rutherford, Anna Karenina by Leo Tolstoy, The Romanov Prophecy by Steve Berry, and The Brothers Karamazov by Fyodr Dostoyevsky. Peter Ilyich Tchaikovsky, Sergei Prokofiev, and The Pyatnitsky Choir. Dr Zhivago (1965), The Last Station (2009), and Enemy at the Gates (2001). Pirozhki (baked, or fried, filled buns), blini (thin pancakes topped with sour cream, fruit, or caviar), and borscht (beet soup). Amber jewellery, matryoshka (painted nesting dolls), and Lomonosov Porcelain. Bring all prescription and over-the-counter medications you'll need, as they are not always available in Russia. A pocket pack of tissues is also a good idea, as many toilet facilities lack paper. The Maslenitsa Festival is a wild party of food, theatre and revelry in the week before Lent. The Stars of the White Nights Festival in St Petersburg is a great opportunity to see excellent Russian ballet and symphonic performances. More information on Events in Russia. -The closest points of Russia and Alaska are only two and a half miles (4km) apart. -Something like 10 percent of the Russian government's income comes from the sale of vodka. -Russia is bigger than the planet Pluto. Far from a depressing Soviet wasteland, the Iron Curtain has lifted to reveal Russia as a fascinating and beautiful travel destination..
We are looking for contributors for our Russia travel guide. If you are a local, a regular traveller to Russia or a travel professional with time to contribute and answer occasional forum questions, please contact us.